Falls Creek Snowsports and Disabled WinterSport Australia (DWA) offers one of the most advanced adaptive skier programs in the world. Read on to learn more about Adaptive skiing/riding and the programs offer by Falls Creek and Disabled WinterSport Australia. 2 track skiing involves skiing in a standing position, named after the two tracks left behind them in the snow. The skier wears regular ski-boots and two downhill ski's, and may also use ski-poles. Additional equipment can be used to assist the skier with stability and steering. Ski-bra's fix the ski tips together to help beginners learn how to snowplough and control their speed and direction, and tethers can allow a ski guide to provide additional control. A snow wing which positions the skier within a rubber frame so that the guides can offer steering and support can also be used. 3-track and 4-track skiing involves skiing in a standing position, with the use of outriggers, which are essentially crutches with a small ski tip fixed to the end that offer balance and steering. These ski styles are named after the number of tracks left in the snow behind them by the number of skis and two outriggers. 3-tracks are made by a skier who ski's on a single ski, and 4-tracks made by a skier skiing on two skis. Additional equipment such as ski-bra's can be used to fix the ski tips together to help beginners learn how to snowplough and control their speed and direction. Sit skiing involves skiing in a seated position within a modified, padded seat (a 'bucket') that is fixed to either one or two skis. A number of straps secure the skier into the bucket at the feet, knees, upper thighs and waist. Further strapping needs depend on the person and can be adjusted for everyone ranging from high to limited mobility in the upper body and shoulders. The skier uses two shortened outriggers to assist with balance and to help initiate turns. The ski guide can help control the speed and direction of the sitski by holding onto the bucket. As the skier progresses, equipment such as tethers can be used that allow the guide to ski behind and offer more refined support to the skier as needed. Sit Skiing is divided into two main areas, Bi skiing and Mono skiing. A Bi-Ski is named so because the bucket is attached to two skis. The Bi-ski's are stable with a low centre of gravity. These skis are designed so that the skier is positioned close to the snow and the short and wide shape of the ski provides a large snow contact area. The Bi-ski is commonly used by people with high end spinal cord injuries and first time sit skiers, and can also be used as a progression point towards the Mono ski. A Mono Ski is named so because the bucket is attached to one ski. The mono-ski provides for more advanced skiing, with a higher centre of gravity and a thinner, longer ski shaped for speed and agility. It is therefore less stable, but provides the skier with a greater opportunity for performance. The bi-ski design also incorporates a shock absorber and suspension system into the frame to absorb bumps, much like knee joints offer for upright skiers. Adaptive snowboarding involves boarding in a standing position on a snowboard. The boarder wears regular snowboarding boots and uses a regular snowboard. Additional equipment can be used to assist the rider with stability and steering. The two most common are the Snow Wing and the Snow Slider. The snow wing is a rubber frame which positions the skier within it so that the guides can hold it to offer steering and support. Short tethers can also be attached to the snow wing for more refined control by the guide. The slider is a frame that attaches to the snowboard under the bindings so that the guides can support to the boarder and a handle at the rear of the frame can assist in manoeuvring the snowboard. This equipment will be used in association with a support belt which the boarder wears to allow the guide to assist in manoeuvring the actual snowboarder. Skiing and riding for people who have a vision impairment, can involve various pieces of equipment including plastic poles. The most important thing for a VI skier or rider is have a Guide/ Instructor who uses various communication techniques to support them in their skiing/riding. For reasons of safety skiers and riders with a vision impairment and their guide are required to wear a 'High vis' bib to identify them to fellow guest while on the slopes. Falls Creek with the support of Disabled WinterSport Australia offers access to highly trained internationally recognised instructors to meet the needs of the skier or rider with a disability. At Falls Creek we offer both private lessons and ski camp programs, taught with the use of specialized equipment, and includes sit-skiing, alpine and snowboarding activities. With these resources we can offer adaptive activities for a wide range of disability groups. In addition, Disabled WinterSport Australia members receive a 50% discount on Snowsports School and Ski Lift products. Introductory Programs - For your first time to the snow! Recreation Programs - Now this is a pursuit I'm interested in! From beginner to advance levels, our recreational programs can assist you towards independent skiing on the slopes. Participants are supported by instructors and ski guides to develop individual skills and confidence across a wide range of adaptive disciplines. Experiential Programs - Free riding in the mountains! 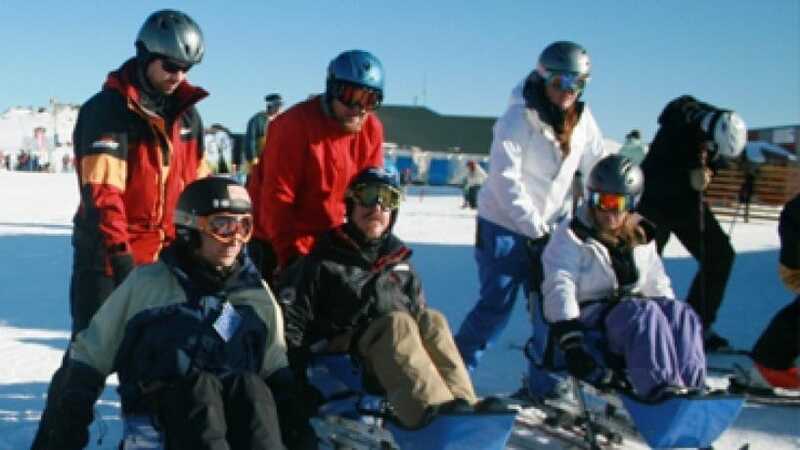 Aimed at high level disability groups our experiential programs have an emphasis on the full alpine experience; enjoying the mountains and fresh air you are assisted by our ski guides to tour the ski resorts. To find out further information on DWA camps operating at Falls Creek this season go to our website below or contact DWA on 1300 265 730. Disabled WinterSport Australia (DWA) is a member based organisation. Membership is essential for a participant or volunteer, to access our member benefits including adaptive equipment, concessions, programs and camps run by DWA. Lift ticket: access to concessions on subsidised lift tickets across all of Australia's alpine resorts. For more information on how to become a DWA member to receive your 50% discount on lifting and lessons at any Alpine resort in Australia go to www.disabledwintersport.com.au and head to the membership section.